With so much attention devoted to interior design, the exterior of a home can often get overlooked, but as the first thing that welcomes both us and our guests, it is worth devoting some time tending to the outside of your house. Furthermore, focusing on the contemporary kerb appeal of your home can add significant value if and when it comes time to sell up. Georgian, Edwardian and Victorian homes, with their bay windows and elegant plasterwork, often benefit from built in architecture advantages, but even if your house design is unassuming from the outside, small decorative and structural improvements to the contemporary exterior of your home can equal huge impact. Key areas of building design to focus on are the front door, the driveway or approach to your home, the porch area, the windows, the facade and the roof. And just a note of caution... before any significant contemporary exterior architecture gets under way, check first whether you need planning permission for your exterior house designs– this applies particularly to listed houses or buildings in a conservation area, but it’s better to be safe than sorry. How do I update my home’s facade? When it comes to updating the facade of your home, painting is the quickest and most affordable way to achieve a contemporary makeover, and if you opt for a colour other than white it can really make a statement (although sticking within the palette of your road and local area is advisable). A makeover that requires a bit more patience but can add romance and character to the most mundane of homes is to adorn the walls with climbing plants – delicate trailing wisteria is ever a British favourite, whilst roses and jasmine offer fragrance as well as beauty. If you’re looking to make more significant changes to the exterior of your home, whether that is adding timber cladding, hanging tiles, installing a bay window or rendering, then you should first check whether your house designs require planning permission. A New England style wood boarded home is beautiful and bright, but remember that it will need frequent repainting if it is going to stay looking its best, whilst stucco render or Tyrolean render can tidy up a home's exterior but think carefully before covering over original brickwork. What should I consider if building a home from scratch? If you’re working with an architect on a brand new build, the options are endless when it comes to deciding on the exterior architecture. But first things first, you will need to check planning permissions, building regulations and local restrictions, such as being in a conservation area, to make sure your plans for your exterior house designs will meet stipulations. If you are building in a street with predominantly Victorian facades, with bay windows and side returns, you might need to ensure your house designs fit in with the rest of the homes on the street, but if you’re building in a more remote area you’ll probably have more freedom for your building design. There are many architectural decisions to make, do you want a flat, gabled, hipped, mansard or perhaps even a curved roof? Do you want bay windows? Crittall windows? Perhaps external shutters? 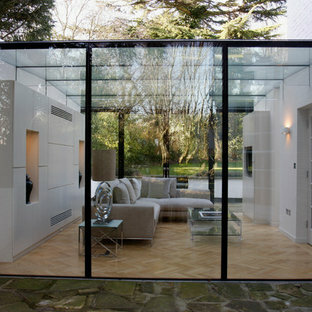 Do you want glass walls? Do you want wood cladding? Do you want a very symmetrical building design or something more contemporary? The decision is all yours but remember to consider the benefits of various materials over others and the effects that some architecture styles will have on everyday life, for example glass walls will look attractive but will give you less privacy. Your architect or builder will be able to guide you through the best contemporary exterior architecture choices for your house designs. Design ideas for a medium sized and beige contemporary two floor render detached house in Other with a metal roof and a lean-to roof. Photo of a contemporary exterior in Other. This is an example of a medium sized and white contemporary two floor render detached house in London with a tiled roof. This is an example of a contemporary exterior in London. Inspiration for an expansive and red contemporary brick exterior in Hampshire with three or more floors and a hip roof. 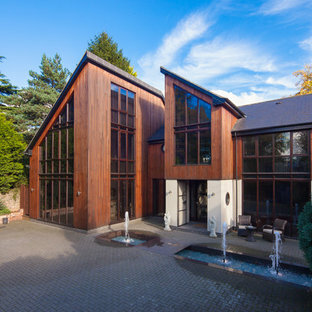 A very specific brief was given with the space to be a very contemporary entertainment area that both complemented the existing garden and house. Inspiration for a medium sized and brown contemporary exterior in London with wood cladding and a pitched roof. Inspiration for a brown contemporary two floor brick detached house in Vancouver with a pitched roof and a metal roof. 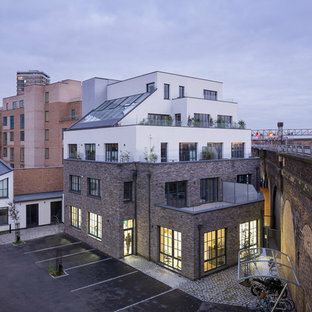 Photo of a small and gey contemporary brick exterior in London with three or more floors and a flat roof. 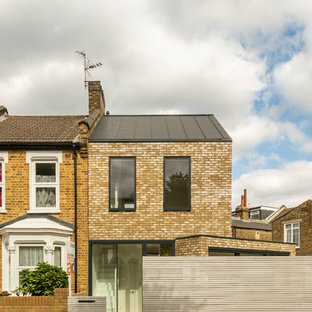 Medium sized contemporary brick terraced house in London with three or more floors and a flat roof. 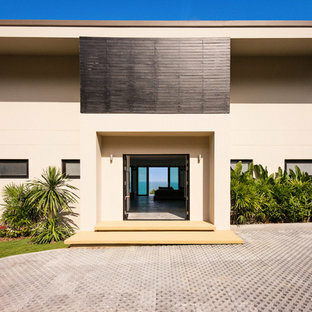 This is an example of a contemporary two floor exterior in Channel Islands with a flat roof. Inspiration for a contemporary one floor exterior in Other with wood cladding and a pitched roof. 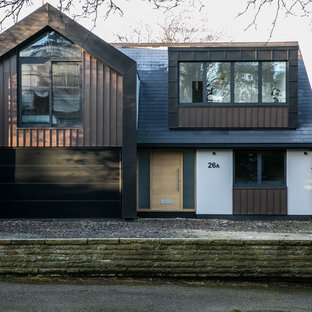 Photo of a contemporary exterior in Other with mixed cladding. 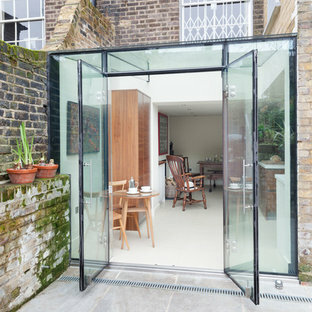 Photo of a small contemporary exterior in London. Large and brown contemporary brick detached house in Other with three or more floors. 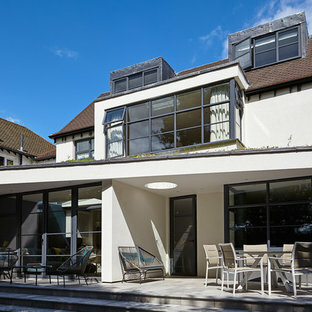 Photo of a contemporary exterior in London.